Viewing 2 current events matching “free” by Date. Viewing 215 past events matching “free” by Date. Bucardo is a mature replication system written in Perl for PostgreSQL that supports asynchronous replication for both master-slave and multi-master systems. Originally designed for slow and unreliable networks, it has remarkable recovery ability, an easy to use command-line interface and development is active! Uses for Bucardo include: a slave read-only database, multi-master replication, data warehousing and just having fun moving your data around! Will include overview replication for PostgreSQL in general, a tour of features, and a basic configuration walk through. Building a strong business future in Washington County is the focus of a new business incubator located in downtown Hillsboro: Green Sustainable Business Accelerator (GSBA). GSBA offers a new approach to successful entrepreneurship. Instead of fruitless job searches, sending out dozens of resumes and experiencing the reality that a job might be unattainable in the present economy, we offer hope and help to those who would like to take a different approach by creating their own business. Those who embark on that venture need a strong support network and mentoring to be successful. GSBA offers that and more. The Kauffman FastTrac® LaunchPad initiative is being offered in response to the many workers who have lost their jobs and businesses that are struggling due to the current economic environment. It is a proven fact that entrepreneurship plays a key role in getting America back on the road to recovery. Over 300,000 entrepreneurs have participated in FastTrac® programs. Sponsor: The Ewing Marion Kauffman Foundation. Join us Saturday, November 13th for a special showcase of audiovisual performance and interactive art. Glitch-Hop-Folk-Tronic and Visuals by one-man-band Midlman Live DVD Album Recording! How can PortlandWiki present a more inviting user interface? Rehearse sampling of community-approved hijinks and practical jokes in anticipation of upcoming April Fools Day. Come enjoy some friendly discussion! We usually have a good time. PortlandWiki front page news blurbs! We want your contributions! We're fun-luvin' geeks who generally have a good time. Come experience the revolutionary ShoreTel IP phone system from the team at Matrix Networks. Recently awarded the 10th best out of over 800 ShoreTel vendors World wide, Matrix is the solution provider for all your communication needs. Join us for Happy Hour complete with hors d'oeuvres and adult beverages!!! If you have questions or want to let us know you're coming, send us a message at hello@switchyardcreative.com. Ubuntu, Mint, Debian, Fedora, ArchLinux. What are all these distributions (flavors) of Linux and how are they similar and different? Come learn about many different versions of Linux and try them out on our test machines. Learn the basics of installing your chosen version of Linux on your own computer. Come prepared to have fun and ask questions. Please sign up in advance by visiting the volunteer desk at Free Geek or calling us at 503-232-9350. New to Ubuntu/Linux and have a Windows program you just can't live without? Learn how to search for Linux equivalents or use programs like Wine to make your Windows programs compatible with your computer. A few PDX orgs passionate about increasing the numbers of women in tech invite women of all levels of interest and involvement in tech to join them for a career-building interactive booths, networking, and refreshments. Whether you have a lot to learn or a bit to teach, we hope you join us. Additional sponsorship opportunities available - contact Kari.Naone@techoregon.org. Have a broken lamp or a jacket with some holes in it? Come get your items fixed for free at our Repair Cafe next Thursday. On September 19th, Repair PDX volunteers will be fixing bikes, clothes, home appliances, electronics, speakers and sharpening knives and tools! This month through the end of 2013, Brunch has its own apartment, smack in the middle of downtown Portland. Please Note: Brunch has slimmed down. Talks start at 12:30, and everything finishes by 2pm. We are doing something a bit different this month. A member of the RC Board has been working with the Lewis and Clark College Venture competition and suggested we have some of the student businesses do a "dress rehearsal" of the final pitch they will present to a panel of judges where they could receive up to $30,000 in funding for their venture. In keeping with the spirit of the competition, we're going to give you very little info about these businesses. The students will be looking for feedback on their presentation and how well they pitch their venture. Exciting! Lewis and Clark Venture Competition An overview of the competition and Lewis and Clark's new entrepreneurship program. Portland Mushroom Company The goal of the Portland Mushroom Company is to provide high-quality locally produced oyster mushrooms to the Portland metropolitan area and lead the way in urban mushroom cultivation in the Northwest. The goal of Forge Portland is to provide a shared workspace for nonprofit organizations that helps accelerate progress toward their goals by reducing overhead costs, pooling resources, and creating a vibrant and collaborative atmosphere. We're back and hosting an Esri GeoDev Meetup on Monday, November 10th with a new format. Food and beverages will be provided at the meet up. Meet cool people. Show us what you got by demo'ing your application or framework. Present a cool new/interesting concept or idea. Impress someone by sharing your experiences. Make BFFs for life - connect with other developers! Meet Up Schedule - New Format! 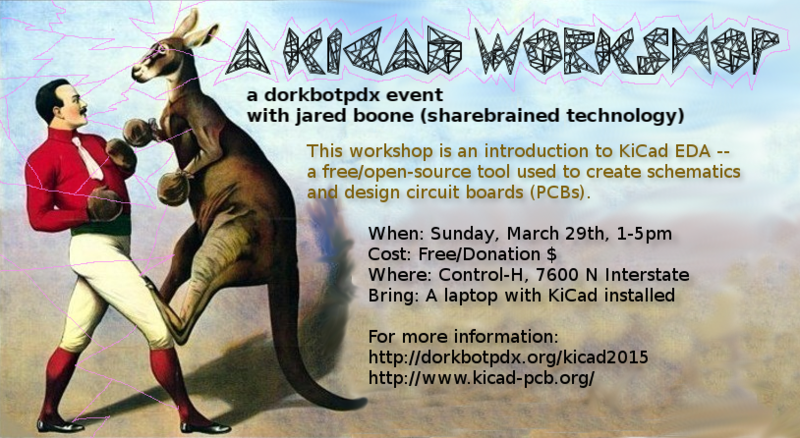 Now's the chance to learn KiCad! "KiCad is an EDA software suite for the creation of professional schematics and printed circuit boards up to 32 copper layers with additional technical layers. KiCad runs on Windows, Linux and Apple OS X and is released under the open-source GNU GPL v2 free of charge." The workshop will be hosted by hardware ninja Jared Boone of Sharebrained Technology and HackRF fame. The Urban League of Portland’s 22nd Annual Career Connections Job Fair will be held Wednesday, April 22, 2015, from 10:00 AM to 3:00 PM at the Doubletree Hotel (by Hilton), near the Lloyd Center (1000 NE Multnomah St, Portland, 97232). This annual event gives job seekers the chance to meet face to face with recruiters from some of the area’s most desirable employers. These recruiters come to the Career Fair to seek qualified diverse candidates for positions from entry-level to professional, from management to executive, ranging from construction and retail to government and corporate opportunities. • Portland and surrounding area employers are hiring now! • Employers are looking to the Urban League of Portland to help them recruit diverse job candidates! • Employers are hiring for positions from “entry level” to professional, ranging from construction & retail to government and corporate opportunities! • Now is the time to connect with Portland area employers! Bring your resumes and dress to impress! • Be prepared to interview on site. Over 60 employers are participating in the Career Fair this year. Attendees can be interviewed on site or make arrangements to be interviewed at a later date. A special thanks to the events sponsors:: IHeartMedia, JAM’N 107.5, Comcast, Bank of America, the Pacific Northwest Regional Council of Carpenters, the Pacific Northwest Carpenters Institute, the Oregon Bureau of Labor and Industries, the Oregon Department of Transportation, Port of Portland, the Oregon Health Authority, the Portland Development Commission, and the Oregon Lottery. The Hillsboro Chamber is excited to announce our first startup practice pitch through Pitch Perfect Hillsboro featuring Distributed BioSystems, Inc. Join us THIS Thursday, October 8th from 4:30-6:30 pm to support this local startup. Attendees enjoy networking, pitch, and Q&A session. This event is FREE, though RSVP's are necessary to prepare so if you intend on going, please RSVP to AimeeS@hillchamber.org. Snacks & drinks included. EAST Knowledge invites you to attend our sixth meeting! All are welcome! Have show-n-tell demonstrations of the earliest and simplest of such devices: The diode. Come and learn something old! Vacuum tube diodes were put to use in the early days of radio as "detectors", because they were more robust and reliable than crystal, mechanical, and chemical contrivances used for this purpose. With further development, thermionic vacuum and gas diodes advanced to be capable of power rectification with ever greater efficiencies. Many example devices from the 1930's to 1950's will be available to examine. There will be orange, purple, and blue glows in the demonstrations! What is Camp Optimization? Camp Optimization's mission is simple: provide a casual, fun and informative forum for digital marketers and technologists to share optimization best-practices, challenges and wins. This month Ryan Campell joins Camp Optimization from Add3 (Add3 is a digital marketing agency that delivers integrated digital marketing campaigns across search, social & display advertising, helping our clients reach their marketing goals) to talk on behalf of pay per click marketing. PPC is one of the most measurable digital marketing channels available. Come learn actionable strategies and tactics you can implement to take your optimization campaigns to the next level. Ryan has been leading and managing digital marketing campaigns for almost 10 years. He's optimized campaigns as an in house manager and now, at an agency. Ryan has a deep passion for performance based digital marketing and is an expert in paid search, SEO, and paid social media. We will be meeting at Baerlic Brewing Company for some beer and casual networking. First round of beer is on us! This event sponsored and hosted by roboboogie. Who is roboboogie? Roboboogie is a Portland-based customer experience optimization agency partnering closely with brands to improve conversion rates, nurture brand advocacy and increase customer value. You've learned a lot and been inspired, now get some work done. Bring you laptop or notepad, we supply Internet, printer, coffee and an environment to enhance productivity. Also available for free trial is 2 hour slots on our cyc wall (advance reservation required - email dayna@nxt.industries). What is Ignite? Ignite is a high-energy evening of 5-minute talks by local people who have a burning idea and the guts to get onstage and share their personal and professional passions. Quick, fun, thought-provoking, social, local, and global - Ignite is all of these and more. This Ignite is focused on all things tech. Meet our Emcee: Alex Payne Alex Payne is an angel investor and advisor. He works with companies in Portland and around the US. Alex cofounded online banking service Simple and was previously an early employee and Platform Lead at Twitter. You can probably find him at Next Level Burger on SE Hawthorne & 41st. Mar 12, 2016 EAST Knowledge - The Joys and Sorrows of 3D Printing! EAST Knowledge is excited to host Michael Yurkoski for our seventh meeting. Join us for Michael’s talk describing his experiences with using a 3D printer in the home. All are welcome! We hope to have time for Q&A at the end. If you’ve been curious what all the fuss over 3D printers is about, or would like to commiserate with a fellow 3D printer enthusiast, join us for our meeting. We hope to see you there! We love data and so do you! Join Keen IO and PIE (Portland Incubator Experiment) for a casual drinkup! Chat data, startups, and APIs, tell us what you really think about our services, or just swing by and hang a bit. "host": "Keen IO & PIE"
1) Vancouver School District - Is seeking programmers to participate in the TEALS program at their school. This program is an effort out of Microsoft that puts technology professionals in the classroom. 2) Developing Mainstreet - This May 23rd event is a collaboration between VanTechy and The Bridge. We are working to bring together "techies" and traditional small business owners. This is your chance to help grow your local economy and we are looking for both subject matter experts and small businesses that would like to attend. EAST Knowledge is excited to host James Richey for our eighth meeting. Join us for James' talk sharing what he's learned about Mayan EDMS. There will be an interactive demonstration, so bring your laptops! All are welcome! Come and learn something new! We hope to see you there! Join us for lunch after! We're going to try something different for this meeting. After the talk, anybody who is interested can join us for lunch at Blondie's Pizza, which is a couple of blocks from the library. The last time I was there, they had a $6 lunch special for a salad and a slice of pizza. Blondie's is next to Jazzy Bagels on 112 N Main Ave (map). JOIN US FOR A MOVIE NIGHT! $5 suggested Donation. There will be popcorn, candy, pizza, and beer! Doors will open at 7 pm, the show starts promptly at 8 pm. Older kids are encouraged to come. Tech jobs are growing three times faster than our colleges are producing computer science graduates. By 2020, there will be one million unfilled software engineering jobs in the USA. Through compelling interviews, artistic animation and clever flashpoints in popular culture, CODE documentary examines the reasons why more girls and people of color are not seeking opportunities in computer science and explores how cultural mindsets, stereotypes, educational hurdles and sexism all play roles in this national crisis. Expert voices from the worlds of tech, psychology, science, and education are intercut with inspiring stories of women who are engaged in the fight to challenge complacency in the tech industry and have their voices heard. CODE aims to inspire change in mindsets, in the educational system, in startup culture and in the way women see themselves in the field of coding. A special thanks to The OpenStack Foundation, a donating sponsor for this screening. Get hyped! It's time for another Ladies' Night, v 7.0. Join us at Struck Agency for an evening focused on mentorships, activiities, and general commraderie with other digitally-minded ladies! If you're a designer, architect, researcher, developer, photographer, copywriter, videographer, producer, strategist, or want to be any of these things...you're invited! Food, drinks and great space to enjoy lively conversation provided by Struck. Iterative vs campaign-based approaches to marketing deliverables. How to sort through analytics to determine what are vanity metrics, OPIs and KPIs. Re-prioritizing deliverables and capabilities based on KPIs. Integrating lead scoring and content customization into static campaigns. “Smart Persona” tracking and attribution models. A large part of the presentation will include information on actual tools and metrics that I am currently using so feel free to ask any questions you may have related to the data or examples presented. Garrett Gillas got his start in technology at the age of 12 when he built his first website for his father’s electric vehicle startup. Since then, he has made a career out of helping business use digital marketing to grow their business. Garrett is currently a Marketing Manager at Tripwire where he oversees all web properties, paid media and related demand-gen analytics. Before Tripwire, he spent the last 10 years working with digital advertising agencies including Razorfish and CMD. His past clients include Netflix, Microsoft Xbox, HP, Hawaiian Airlines, IBM, Google, Urban Airship and Intel. Garrett is a Portland, Oregon native. This meetup gives you two sneak peeks, one IRL and one in VR. First, get an early look at CENTRL Office's new eastside location. Second, get an early look at Vectorspace VR. "VectorSpace VR specializes in building large scale, immersive VR exhibits that streamline a myriad of technologies, including: IR motion tracking, Oculus Rift and mini backpack PC’s, to create unprecedented experiences. "We have just installed our first VR system in Chicago for a large haunted house attraction company and look forward to exhibiting this content for Portland’s local tech community." As always, refreshments will be graciously provided by our hosts at CENTRL Office. Attend LaunchCode Portland LC101 Info Session at Portland Community College's CLIMB Center for Advancement on Thursday, February 23rd. Get all the details about the 20-week FREE coding class. Ask any questions of our Portland LaunchCode staff, and generally find out how awesome an opportunity this is! When: Monday/Thursday nights -- starts April 17th Time: 6-9pm Cost: FREE. No, we're not offering half-priced manhattans. Even better: Get some work done at a hot desk for a couple of hours for free! You'll have access to our high-speed internet, hot desks, comfy seats, kitchen, bistro tables, coffee and tea, fun diversions for work breaks, and free parking. You're also welcome to grab one of the meeting rooms if it's not reserved or in use. Check out coworking for free! If you need space to work, others to collaborate with, and coffee to drink, join us on July 18. You'll have access to a desk, Wi-Fi, coffee and tea, kitchen, eating area, and conversation area. Check out coworking for free! If you need space to work, others to collaborate with, and coffee to drink, join us on August 16. You'll have access to a desk, Wi-Fi, coffee and tea, kitchen, eating area, and conversation area. Skill Share: Advanced SEO Workshop. FREE. Skill Share: Advanced SEO Workshop A hands on workshop showing exactly what SEO professionals do to rank their client's websites every time! What People Will Learn: This skill share will be a combination of workshop and a Ask Me Anything session. Brie and Viola will cover the foundations of a good SEO strategy, keyword research and SEO optimized content creation. They will show you exactly what they do to help clients rank time after time. This is incredibly valuable information, distilled from 10 years SEO experience. They will work on a few of your sites during the presentation, so come and let them check your site The second part will be a Ask Me Anything, to answer your questions about SEO. Rick Gilbert joins us to speak about his business, Grafletics, a design and apparel company. He’ll delve into his story, business concept, and how he found a niche in a crowded market. He has over 10 years of experience working with both world-class brands and alongside entrepreneurs transitioning their life’s passion into their life’s work. In 2008, Rick formed Rick Gilbert Design and successfully built a top-tier client roster across the U.S. working with brands in the athletic and outdoor industry. About Mad Data & Design For those interested in data, design, tech, and digital marketing, Mad Data & Design is the place to be. You'll learn about companies that innovate, meet people and partners, and enjoy a drink. We invite speakers who have knowledge to share, a story to tell, or tips and inspiration. Join us! Please join us for our August Accelerate Biotech & Digital Health PDX Happy Hour at the Portland Incubator Experiment (PIE)! A huge thanks to PIE for hosting us in their wonderful space. We have several open mic opportunities at each of our events. If you would like to speak about your startup or introduce yourself or your idea to the group then please reach out to [masked] for more information. This class is part 2 of an introduction to programming concepts with Python. Class covers lists, loops, tuples, dictionaries, and using modules. There are a number of practice exercises.